Norman Mailer's brilliant teleplay deserves to stand alongside the finest work that he has ever done. 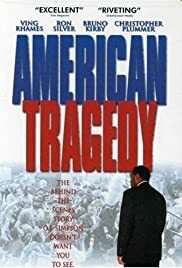 Adapted from Lawrence (`Perfect Murder, Perfect Town') Schiller's book in collaboration with newcomer James Willwerth, it almost dispels the stigmas that the media conviction imposed on the OJ trial from the beginning. There are some disappointments from the cast - possibly because expectations were so high based on Ving Rhames' dazzling embodiment of Don King, and the backgrounds of some other stellar personages present here. Most deficient is Bruno Kirby as Barry Scheck; wrong for the part physically and inflectionally. But Ron Silver is as on target as Robert Shapiro as he was as Dershowitz in `Reversal of Fortune.' You can't say more than that, can you? Mailer explores at great length the facets of Shapiro's courage and genius contributing to the defense, and only fleetingly touches upon the jerk he became later on. Christopher Plummer does not look like F. Lee Bailey, and the characterization never attains the stature of its depictee. Bailey was and is one of the towering figures of the 20th century, the Disraeli and Dreyfuss and Clarence Darrow of modern times. The two female leads are magnificent. The gifted and beautiful Sandra Prosper is Shawn Chapman, a fledgling figure inside the team - a dips**t girl spouting caucasiphobic cliches who grows into an insightful woman adept at absorbing and reflecting and expanding upon the greatness that surrounds her. And Diana LaMar is 100% at recreating the imperious and acerbic Marcia Clark.